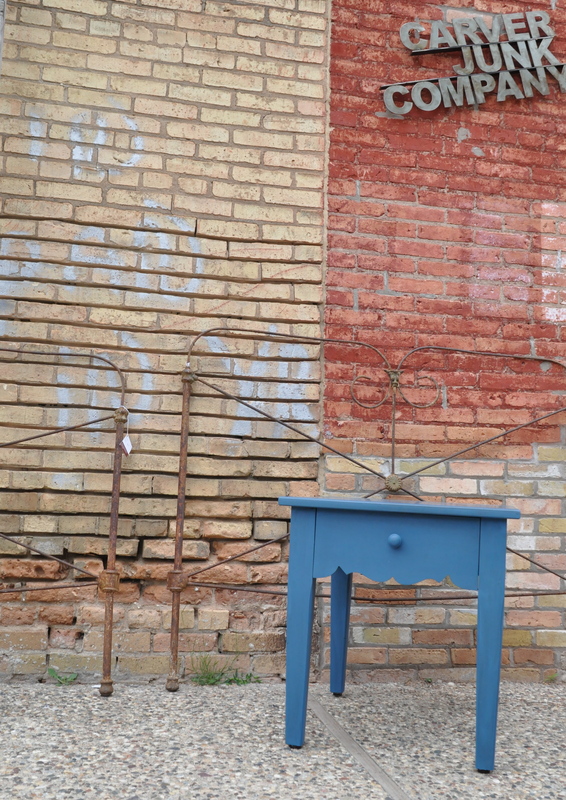 Every month, Miss Mustard Seed features a Milk Paint color of the month, and every month, I make a valiant attempt to use the color on a piece of furniture for the store. August's color of the month is Flow Blue. I did it. 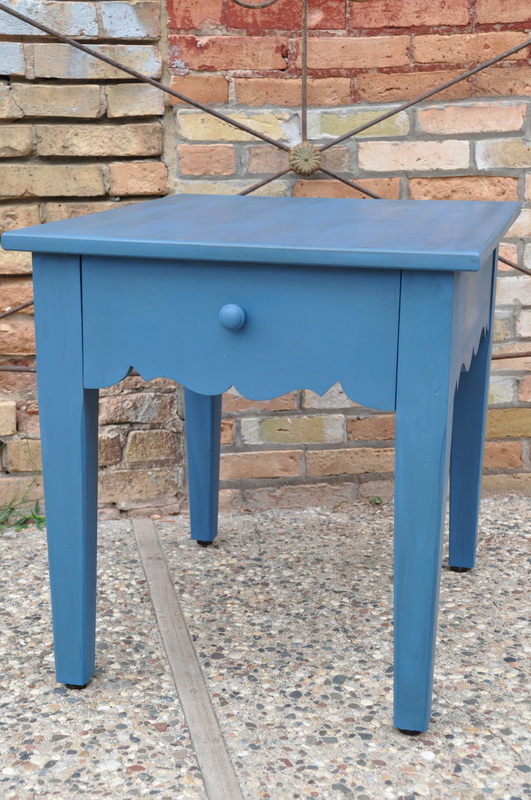 I actually painted a table this month! It wasn't a big table, but combine a crazy busy month at the store with having a 4-week old baby at home, and it felt like a pretty big accomplishment. 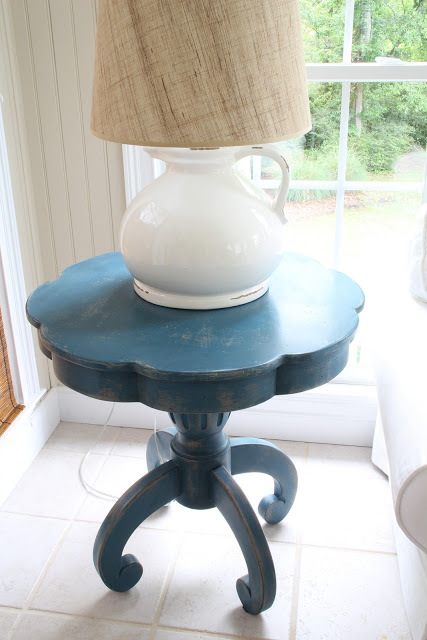 I didn't take a Before photo, and the process itself wasn't all that exciting - I didn't even distress the table - just painted and finished with Antiquing Wax. Voila! Sometimes simpler is better. With the great scallop detail, it didn't need a lot of help to look great. Because I'm not all that exciting with my "how to" details this month, I thought I'd share some Pinspiration. 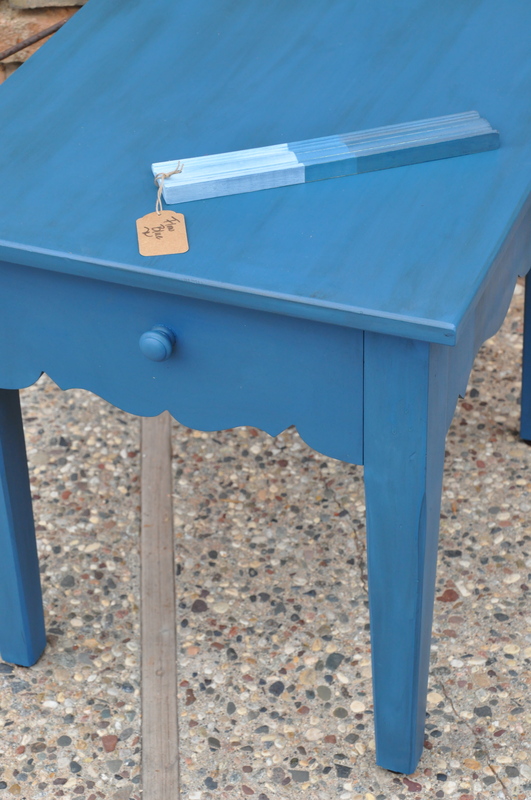 There are tons of amazing examples of Miss Mustard Seed's Milk Paint in action out on Pinterest, and these are just a few of my favorite Flow Blue pieces. Check it out, folks, Pinspiration - these are not mine, and sorry, that means I cannot sell them to you at the store. But you can drool over them, come buy some paint from us, and create a masterpiece of your own! Wondering why it's called Flow Blue? This amazing antique china is called Flow Blue for the way the color bleeds outside the pattern, and inspired the name of the paint. Isn't it gorgeous? Next month's color is Shutter Grey. I can't promise that I'll personally get a piece painted in it, but we DO have a really fun contest planned with all of our dealers, that involves all of you voting. And prizes and stuff. Watch Facebook for more details!